Cal Poly’s Master of Science in Taxation program was recently ranked No. 1 for value among graduate tax programs in the nation by ValueColleges.com. The program, offered by Cal Poly’s Orfalea College of Business, is one of four public programs in California to make the list. To create its rankings, ValueColleges.com took into account U.S. News and World Report reputation scores of the university, return on investment metrics from the Department of Education’s College Scorecard data on alumni salaries, and cost per unit. According to the rankings, Cal Poly’s program stood out due to its strong recruiting relationships with major firms, its U.S. News and World Report rankings, and its Learn by Doing approach, which includes an industry internships for students. Cal Poly’s program was also less costly than more than half the other programs ranked. The M.S. Tax program is led by Academic Director Professor Rodney Mock. He has helped the program cultivate a sterling reputation with major firms and corporate partners. The network of Cal Poly alumni in accounting has also expanded significantly, with graduates exceling in public accounting, private industry and government positions. Pursuing a master’s degree in tax proves to be a reliable career choice. Cal Poly’s M.S. Tax program boasts a 100 percent placement rate for its graduates. The Orfalea College of Business is working to expand its undergraduate and master’s programs to meet increasing demand from industry for CPA-eligible professionals. 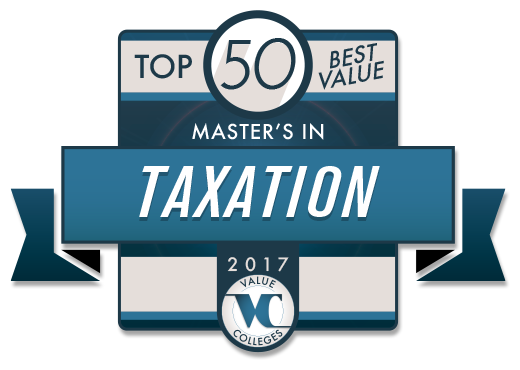 To see the full rankings list, visit http://www.valuecolleges.com/rankings/masters-taxation-2017/.